Traveling to film fishing videos can be risky. Weather can cripple water conditions instantly. This was the case Tuesday when we arrived on the banks of Southwest Virginia’s Cripple Creek. Following several weeks of on and off heavy rain the creek wasn’t in good shape. It was high and almost muddy. Visibility was fewer than six inches and with more rain falling all week we knew it would be a chore to successfully fish it. After retreating to Big Tumbling Creek and other SWVA small streams for two days we hoped Cripple would clear and fall later in the week. We returned Thursday afternoon to find marginally improved conditions. Visibility was better. Flows had diminished. Fortunately, we had a few hours to spare before the next storm rolled in that evening. Because a group of 30 anglers reserved the main portion of the creek at Cedar Springs Sportsman’s Lodge we worked with a local dairy farmer to film on his property, which is upstream of the section most anglers are familiar with. The lodge put a few rainbows, golden rainbows, browns and brooks in here for us prior to the major blowout. 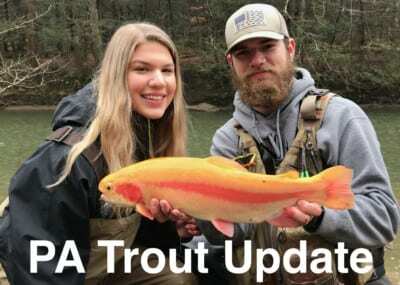 We were concerned they were flushed downstream and after fishing it we believe they did (which is good news for those of you who frequent this stream). Our goal in flying to Virginia was to film exclusively with the new Fire Balls. However, given the horrid conditions we opted to flush that idea. Instead I placed a box of 20 different Pautzke Fire Balls, salmon eggs and Fire Bait in the mud and told the guys they could use anything they wanted. We were no longer fishing a stocked stream, rather on a search and attempt to see if there were any trout still around mission. 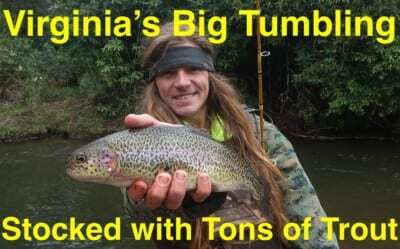 With marginal conditions plaguing us we combed roughly a half-mile of stream and managed to plunk about a half-dozen adult trout out, including two golden rainbows. Most were rainbows up to five pounds. All the fish were caught in the deepest holes and out of the main current, which were areas that were easy to locate given the turbulence. Fishing wasn’t easy. We had to work harder than normal to catch fish, but keep in mind we weren’t fishing on the famous, well stocked section anglers have to reserve to fish. We didn’t use Fire Balls on this outing. One of our guys used Silver Label, exclusively. The other only wanted to use Fire Bait, since that’s what he normally has success with. On the other hand, he tweaks Fire Bait by combining Peach Garlic and Garlic Salmon Egg and seems to be on to something. Each bait caught a golden and a few rainbows. Ironically, we left the state Friday to regroup for filming in Pennsylvania the next two weeks. As we retreat from the Appalachians the water levels are coming down, too. Cripple Creek will likely mold back into shape this weekend and fish perfect next week. 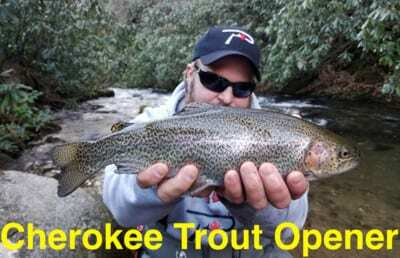 If you’re looking to catch some of the best trophy trout in The South there’s few places that rival it. We’ll likely be back in the fall to see if Mother Nature gives us a break next time. Editor’s Note: Pautzke salmon eggs and Fire Bait are available at Walmart and Bass Pro. 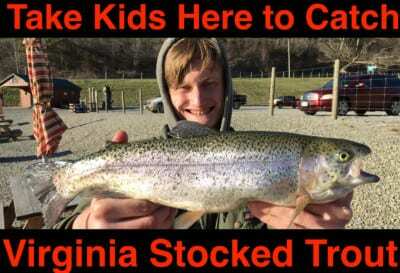 To learn more about fishing Cedar Springs please visit http://cedarspringstrout.com.